Hershel Dennis was part of what many still consider one of the greatest classes of high school prospects to come out of one school in the same year. Long Beach Poly’s 2001 roster was littered with top-end talent destined for Division I college programs. Nearly every level of the team could boast an All-American or All-Everything position player. Tight end Marcedes Lewis, check. Safety Darnell Bing, check. Six-foot-six offensive lineman Winston Justice, double check. Then there was the quick and shifty Dennis, nicknamed “Patch,” who rushed for over 1,700 yards and 24 touchdowns his senior year, landing himself on countless All-American and awards lists. He always saved his best for the biggest moments, racking up 161 yards against eventual national champion De la Salle in a showdown at Veterans Stadium and 189 yards and three scores against Edison High School in the CIF Division I final. The limelight, the success, the utter dominance—it was just the Jackrabbit way, Dennis explained. “The Long Beach Poly Five,” as they were known, broke up after graduation, with Bing, Justice and defensive end Manuel Wright joining Dennis at the University of Southern California (USC) while Lewis chose to attend the cross-town rival University of California Los Angeles. For Dennis, that was where the luster of his football career started to dull. After sitting behind more seasoned running backs his freshman year with the Trojans, Dennis gained the starter role during his sophomore campaign. During the 2003 season, he started all 13 games for USC, rushing for 661 yards and four touchdowns. The season also included a career best 85 yards in the season opener when the Trojans went into Jordan Hare Stadium and blanked the Auburn Tigers 23-0 en route to being voted national champions by the Associated Press. After dropping to a reserve role in 2004, the injury bug hit. Dennis tore the anterior cruciate ligament in his left knee before preparation for the Trojan’s bowl game and would miss the entire 2005 season. Dennis would tear the same ligament again before the 2006 season, and in total, spend six years on the Trojans’ roster due to medical exceptions made by the NCAA. He ended his career scoring a touchdown in the 2008 Rose Bowl and, by virtue of his injury-extended stay, the winningest (70-8) college football player of all time. But when the curtain closed on his collegiate career, there were’t people beating down his door for him to play for their team. The phones remained silent as National Football League executives passed on the resilient Poly alum, leaving him mired in football purgatory. An athlete all his life, he now was without a team. “When you’re going through that time in your life, you’re leaving college, things aren’t working out for you, teams aren’t calling, you’re not getting picked up… As a football player and you’ve played football for 85% of your lifetime, being active and athletic is really all that you know,” Dennis said. So he stayed active and in hopes of reviving his football career, moved to South Dakota in 2012 to join an arena football league. After a season with the Sioux Falls Storm, he bowed out of the pursuit of football to focus on providing for his family. Then, last year he got a Facebook message from a certain Shawn Zobel, who had an opportunity for Dennis to play professionally again—but it wouldn’t require pads or a helmet. Zobel was selling professional rugby to Dennis. 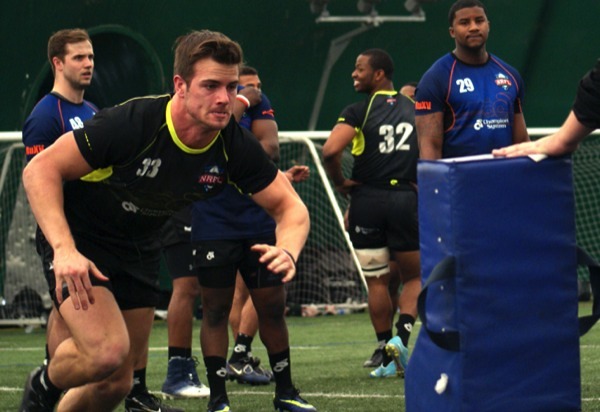 The National Rugby Football League (NRFL) was hosting its first ever combine in Minneapolis as it prepared for its launch and it wanted Dennis and other ex-collegiate and professional athletes to consider rugby as a career alternative. Dennis and over 130 athletes, including 40 ex-NFL players, attended the combine in Minnesota. Zobel estimates that there are about 10 to 15 graduating seniors annually on over 200 college football teams across the country but the NFL and its roster restrictions—53 active roster, 10 practice squad—only allow for about 200 rookies to make professional teams. That, added with attrition and veterans being cut to make room for younger legs, has created a crop of top flight athletes looking for jobs. Dennis, though, is no stranger to rugby. He’s part Polynesian and Samoan and grew up playing rugby with family. On a trip to Samoa when he was 12, he spent his mornings playing rugby with the kids in the village. HIs background and love for the sport combined with his football connections have helped the recruitment process immensely. But Zobel was quick to note that the search for players hasn’t been limited to football. Even though his background is in scouting collegiate players for NFL teams (which is how he met Dennis), the league is looking for elite athletes, regardless of their backgrounds. There are over 900 collegiate rugby teams, both male and female, registered with USA Rugby, the national governing body for the sport in the United States. There have been prior attempts to start a professional league in the country but none have stuck. Zobel said that the league, which is hopeful to start up in 2016, wants to supplement the NFL instead of compete against it. 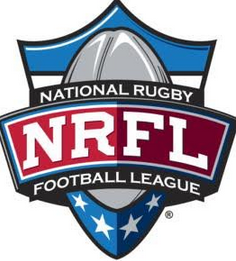 They plan to run the NRFL season in the months between the Super Bowl and the kickoff of the NFL season in September, to fill the void of contact sports left empty by the NFL offseason. “You’re not going to compete with the NFL from August through February, but if you put it from April through June or July, when people are craving something like that, that’s where we think we can have a lot of success,” Zobel said. As far as the learning curve goes, for both players and viewers, Zobel said that while there are differences, the similarities will help create a bridge between the two sports. Instead of a line of scrimmage, there’s a scrum. No wide receivers here; just wings. And players will have to get used to that pesky ball without laces. But tackling is tackling, and if things go to plan, the NRFL could be the sport to satiate the hunger football fans have for physicality. Dennis, though, has been telling his friends whom have either fallen out of the league or never quite made the cut about his new endeavor. It’s different but the chance to be competitive and physical again is an allure that will be hard to turn down. Will American fans take hold to a sport that’s predominantly played in Europe and Australia? If they do, the NRFL has plans to showcase the best players from their first combine, and a second one to be held in Los Angeles at the Coliseum in January, in a showcase game against a top team from Europe in the Independence Cup next Summer. Dennis says that the potential success of the league is up in the air when it comes to the fans, but anyone interested in seeing great athletes go out and throw their bodies around (without pads) won’t be disappointed. He is certain of one thing though: his family is excited to see “Patch” take to the gridiron one more time. Editor’s note: A previous version of this story referred to the league as an Australian Rules Football league, it will actually be governed by the Rugby Union XV rules.